Flickr/karthik Nature photographyWhere have all the honeybees gone? A new study seems to strengthen the evidence linking pesticides used on crops to colony collapse disorder in honeybees. Colony collapse disorder, or CCD, is a phenomenon in which honeybees inexplicably disappear from their hives. The bodies of the dead bees are typically never found. Researchers led by Chensheng Lu of Harvard University have pinpointed the collapse of honeybee colonies on a class of pesticides known as neonicotinoids — insecticides that also act as nerve poisons and mimic the effects of nicotine. Scientists specifically looked at how low doses of two neonicotinoids — imidacloprid and clothianidin — affected healthy bee hives over the course of a winter. The results of the study "reinforce the conclusion that sub-lethal exposure to neonicotinoids is likely the main culprit for the occurrence of CCD," the authors wrote in their paper, published May 9 in the Bulletin of Insectology. Colony collapse disorder was first widely reported in America in 2006. Since then, a complex web of factors has been attributed to the mass honeybee die-offs, including everything from disease, parasites, and poor nutrition to the stress of being trucked around the country each year to pollinate different orchards. Many scientists have theorized that a combination of these factors with exposure to pesticides could be causing the CCD phenomenon. In contrast, the new study found that long-term exposure to small amounts of neonicotinoids wasn't compromising the bees' immune resistance to pathogens. The hives had just as many infections when they weren't exposed to pesticides. This suggests that "neonicotinoids are causing some other kind of biological mechanism in bees that in turn leads to CCD," scientists said. Three neonicotinoids are currently banned in the European Union, but these pesticides are still widely used in the United States. Most corn planted in the United States, for example, is treated with neonicotinoids. And while bees don't pollinate corn, they are exposed to the chemical since the corn's pollen floats to flowers and other crops nearby. In October 2012, the Harvard team setup 18 hives at three locations in Massachusetts. At each location, four hives were fed high fructose corn syrup laced with neonicotinoids and two were left untouched. Researchers planned to monitor the hives over the winter since that's when the die-outs occur. 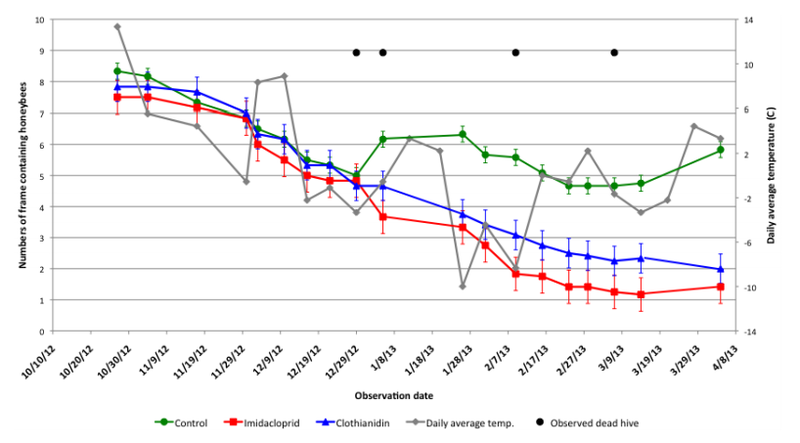 Bulletin of Insectology A chart shows the diminishing number of bees in imidacloprid- and clothianidin-treated colonies (the red and blue lines, respectively) between October 2012 and April 2013. By the spring of 2013, researchers said half of the colonies treated with pesticides had abandoned their hives — the key symptom of CCD. The ones that were left weren't in good shape. Their honeybee clusters were very small and either lacked queen bees or developing bees, the study said. Only one of the untreated colonies was lost, and in that case the bees' bodies were actually inside their hives and showed symptoms that appeared to be caused by a type of parasite. The new study replicates a previous experiment done by the same group in 2010. In that study, the team only tested imidacloprid and found a higher rate of collapse — 94% of pesticide-treated colonies disappeared. They think the disparity might be related to a colder winter, which stresses the bees and exacerbates the effects of pesticides. It's still not clear what role neonicotinoids play in causing the honeybees to leave their hives during the winter, but the researchers note that it might be related to "impairment of honey bee neurological functions, specifically memory, cognition, or behavior." It's been previously suggested that neonicotinoids affect the bees' ability to remember how to get back to their hives. The bees get lost, which would explain why beekeepers usually can't locate the dead bodies. 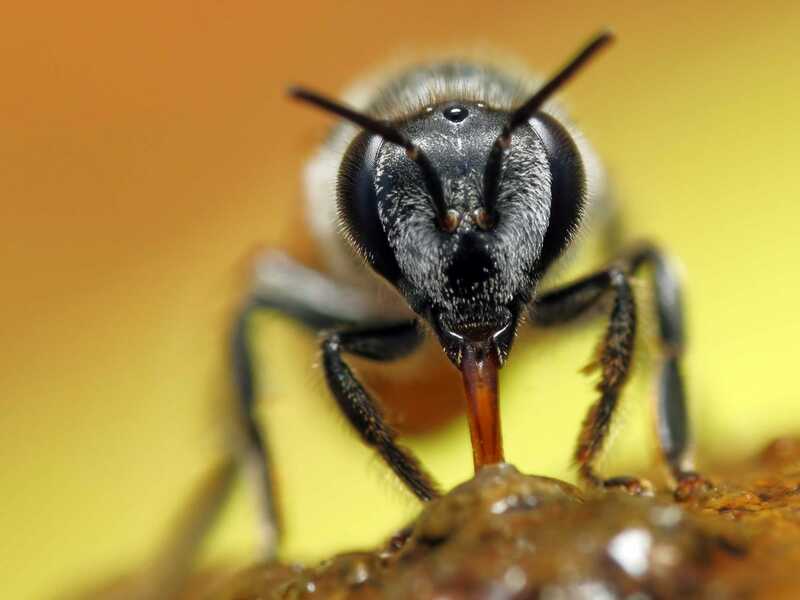 Some bee researchers have found several things to gripe about with this study, including the small sample size, which was also a criticism of the initial experiment. At IFLScience.com, entomologist Jake Bova notes that hive abandonment is not a definitive sign of CCD. "Honey bees may abandon their hives for any number of different reasons, and this study doesn’t control for any of them." Other critics have taken issue with the delivery method of the pesticides. In response to the first study, May Berenbaum, head of entomology at the University of Illinois, noted to The Boston Globe that there's been "no evidence of neonicotinoids in commercially available high fructose corn syrup" and that fact "undermines the premise of bees being exposed to pesticides through the food provided by beekeepers." Further, The Examiner's James Cooper points out the study was published in an "obscure Italian journal" with a measly impact factor of .375 (for comparison, the journal Science, one of the most reputable in the world, has an impact factor of 31.027). Cooper also said the authors "do not account for the fact the France still observes CCD each year, even though they banned neonicotinoids 5 years ago." Objections to the study seem to belie the fact that any research on colony collapse disorder gives much-needed attention to a global crisis that puts us all at risk. One-third of the food we eat depends on insect pollination, mostly by honeybees that are raised and managed by beekeepers. There is no good replacement for honeybees, which are easy to manage in masses and are unmatched in the variety of crops they can pollinate. Everything from apples and cherries to broccoli, pumpkins, and almonds depends on honeybees. Over the last six years, American beekeepers have lost 30% of their hives each winter on average. Some winter losses are expected, but normally in the 5 to 10% range. The Harvard study comes out just before the United States Department of Agriculture is set to release its annual report of winter honeybee losses. In a media alert, the department said that losses are "expected to be significant due to several contributing factors, including exposure to neonicotinoid pesticides."